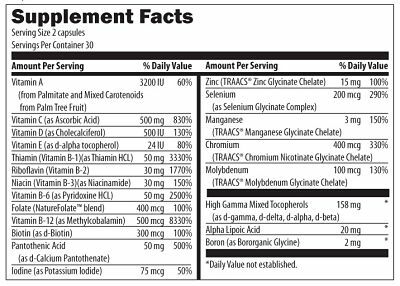 ITG’s Twice Daily Multi Vitamin was designed to provide nutrients that are difficult to obtain in the typical daily diet especially when you are on the ITG 3 Step Weight Loss Plan and you are not eating all of the food groups. Specifically, nutrients such as Vitamin A,B,C & E, 200 mcg of selenium and 400 mcg of chromium. Calcium and magnesium should be taken as a separate supplement. Rich in immune enhancing antioxidant nutrients, vitamins C, E and lipoic acid. High in B-6, folates and B-12, all of which help lower serum homocysteine. Elevated homocystieine is increasingly being recognized as a risk factor for heart disease and birth defects. High in chromium, a trace mineral essential for healthy sugar and fat metabolism. Most diets contain less than 60% of the minimum suggested intake of chromium. Insufficient intakes of chromium lead to signs and symptoms of diabetes and cardiovascular disease. Supplemental chromium given to people with impaired glucose tolerance or diabetes leads to improved blood glucose, insulin, and lipid variables. Chromium also improves lean body mass. Balanced in iodine and selenium content. Both trace minerals must be present in the correct balance in order for thyroid health to occur. Imbalanced intake of iodine and selenium should be avoided as this may impair thyroid function. Contains high dose of biotin, a crucial nutrient for healthy fat and blood sugar metabolism, and healthy nails. Rich in zinc, which is needed for immune function, protein synthesis, and appetite control.